You may already know that the Star Awards is almost here! This is not one to miss!! If you are an admirer of world class authentic Gospel music then there is no better place for you to be than at the Symphony Hall in Birmingham on the 2nd September 2006 for the STAR Awards Gospel showcase. On the evening their will be performances from 7 of the UK’s top Unsigned Gospel Artists from Birmingham, Liverpool, London, Manchester and Nottingham. All 7 have made it through a rigorous selection process and are very capable of crossing over into the mainstream charts. 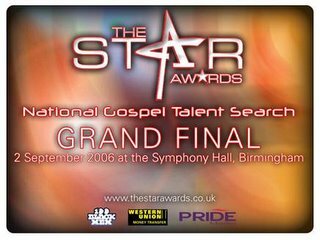 On the evening their will also be performances from some of the trailblazers in UK Gospel music, Noel Robinson, CIE, Ekklesia, Jahaziel and the group who won all the plaudits at the 2005 showcase Divine Unity from London. The evening will be hosted by Nicky Tapper from BBC Radio WM and Gospel music Ambassador Noel Robinson himself. Tickets are available from the Symphony Hall box office on the following numbers. 01217803333 or group bookings on 0800378985..
We are very grateful to our sponsors Western Union Money Transfer, Pride Magazine, 100 Black Men of Birmingham, Bartf, Newstyle Radio, The Arts Council and all our friends and supporters. The count down has begun. Chasing Forever, my debut record will be released on Sept. 19th. Hopefully by now, you have seen my video “Get Away” and if not, check it out on VH1 Soul, Bet J, and www.starstyle.com. I would like to invite you to a few intimate performances and sneak previews of Chasing Forever. 1 of the Original Drifters. Now out of retirement with “The Drifters Revue”. Today as always they present one of the greatest entertainment experiences in the music business. Mr. Alphonso McGruder, 1st Tenor ———Keyboards who was the Music Director for Mr. Ben E. King. 1971 recorded with the ORCHESTRA CAPRI. The Album “Tipico Minus One” was a hit and the Orchestra Capri was named “The Band of the Year”. Also played with Tito Puente, Ricardo “Richie” Ray, Machito, Ray Barretto. Early 80’s to the late 90’s he tour and played the South American Circuit, Colombia, Peru, Venezuela, Ecuador. Formerly with Kid Kyle & The Kool Kats, The Creations, The Channels, The Cords. TV Appearance on The Tony Danza Show, The Joe Franklin Show, Good Morning NY. Mr. Don Thomas, An Original Drifter for over 20 years. 1 of only 3 original Drifters living today. He has toured America twelve times. He has been to Europe and Asia twice. He has appeared on 65 major television network shows. 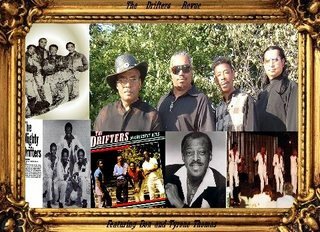 Now out of retirement with “The Drifters Revue”. Writer of “Seven Minutes of Funk”, one of the most sample songs in Hip Hop History. Each individual brings their own experience to the group. As a whole they bring the unique sounds of harmonic blend which echoes throughout the world. VANESSA HAYNES will be making a very special guest appearance at the upcoming ‘WITHOUT BOUNDARIES’ event on SATURDAY SEPTEMBER 30TH performing the songs ‘I WONDER’, ‘EMBRACE’, ‘STEPPIN’ OUT’ etc from her superb debut album ‘STAY WITH ME’. THE LATEST NEW AND ADVANCE RELEASES. COLIN BROWN, FISH, MARK RANDLE. If you think any of your friends would be interested in either of these events – pleases forward this email on to them. still going, so let’s get all the music in we can! extended sets. NO COVER CHARGE!! Most of the Dome catalogue is now available for download on iTunes. Click on the link and launch the Music Store and then choose R&B in genre. You’ll find the new Conya Doss “Love Rain Down” as well as our other releases, including Soul Lounge1 – currently No 5 in the R&B Album Download!